Also known as myofascial trigger point dry needling, dry needling refers to the use of thin needles for the treatment of pain, including pain caused by myofascial pain syndrome. During treatment, a “dry” needle – a needle without medication – is inserted through the skin into specific parts of the muscle, known as trigger points. Unlike acupuncture in Denver, dry needling is based on modern Western medicine, and it is supported by research. At Denver Physical Medicine & Rehab, we offer dry needling in Denver to help patients suffering from chronic pain. Physical therapists commonly use dry needling as part of a larger treatment plan for pain. The technique is used to release or inactivate trigger points to improve range of motion and relieve pain. Research indicates that dry needling reduces muscle tension, eases pain and normalizes dysfunctions at the sites where nerve impulses are transmitted. Trigger points are bands of skeletal muscle that are located in a larger muscle group. They may be tender to the touch, and applying pressure to a pressure point could cause pain in other parts of the body. 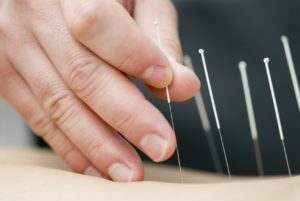 During treatment, thin needles are used to stimulate underlying trigger points, connective tissues, and muscular tissues. Sterile needles are used and disposed of in a medical sharps container following treatment. Dry needling is a safe procedure, and the most common side effects are mild skin bruising and muscle soreness. At Denver Physical Medicine & Rehab, we are thrilled to offer dry needling in Denver. To learn more about this procedure or to schedule a free initial consultation, please contact us today by calling 303-757-7280.